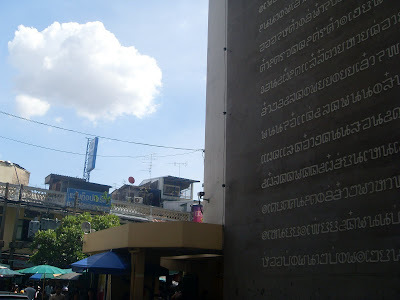 It is a large wall full of old Thai alphabet, the way of writing since it was in ancient time. Very interesting Thanks for sharing I love to see the words of other languages! I'm envious of those who still have their ages-old alphabets. After more than 300 years of colonization, we no longer use our Baybayin alphabet, which is such a shame because it's as pretty as yours. wow, that looks really neat. must be fascinating viewed up closely. Very unique characters. What does it say? Wow! That really is a wall of words! How interesting--I can only hope that I will be able to see such things someday when I do my own travels. Happy WW, and thank you for sharing! This is fascinating and quite a large alphabet it would seem. Nicely-composed photos, too! holy cow! How big is that wall? That is amazing!! Thanks for visiting my blog! Wow !!! ...love your first shot ! ...look very interesting..well done !